Popular Domestic Manufacturer Lava has recently unveiled 3 new smartphones for the Indian market. 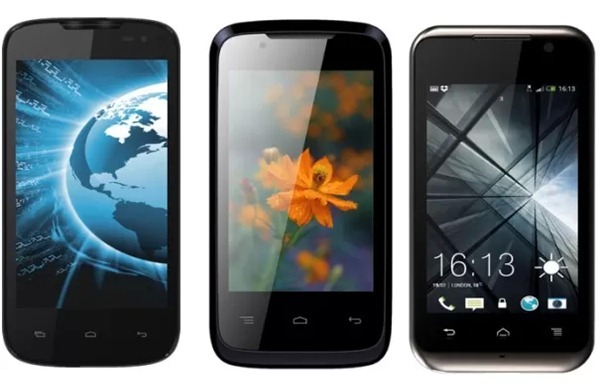 These phones come under the cheaper smartphones available in India, with their price tags ranging from 3499 INR to 5199 INR. Part of the companies Lava’s IRIS series, the models are the IRIS 356, 402, and 349+.The 349+ being the cheapest, and the 356 being the priciest. All the three smartphones are now available at online retailer Flipkart. Lava IRIS 356 sports with a 3.5-inch HVGA display with a screen resolution of 320 x 480 pixels.The smartphone is chipped with a 1.2GHz dual-core processor with 256MB of RAM.and it runs on Android 4.2 Jelly Bean OS.Lava IRIS 356 comes with 512 Internal memory which can be expandable upto 32GB via microSD card slot.The smart phone comes with 1.3-megapixel rear camera with flash, VGA front camera. Lava Iris 402 sports with a 4-inch capacitive touch screen display with a screen resolution of 480 x 800 pixels.The smartphone is chipped with a 1.2 GHz dual-core processor with 256MB of RAM.and it runs on Android 4.2 (Jelly Bean) OS.Lava Iris 402 comes with 512 Internal memory which can be expandable upto 32GB via microSD card slot.The smart phone comes with 3MP rear Fixed Focus camera and 0.3MP (VGA) front-facing camera. Lava Iris 349+ sports with a 3.5-inch TFT Capacitive Touchscreen display with a screen resolution of 320 x 480 Pixels.The smartphone is chipped with a 1 GHz Processor with 256MB of RAM.and it runs on Android v2.3 (Gingerbread) OS.Lava Iris 349+ comes with 512 Internal memory which can be expandable upto 32GB via microSD card slot.The smart phone comes with 2 MP rear Fixed Focus camera and 0.3MP and No front-facing camera.